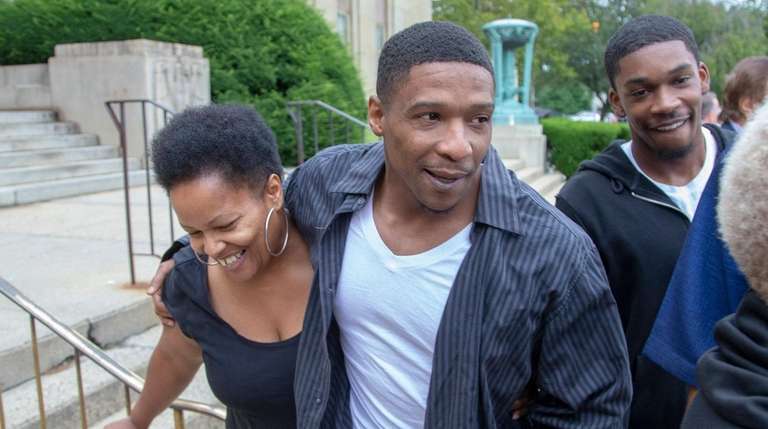 A Hempstead man who spent a decade behind bars for the 2008 shooting of a cab driver that he maintained he didn't commit was set free by a judge Thursday after prosecutors said new evidence showed he was innocent. Josiah Galloway, now 31, turned and winked at his overjoyed family after Nassau County Court officials took off his handcuffs. Then he left to start his new life. "What's in the dark comes to the light eventually," Galloway told reporters after exiting the Mineola building with a throng of smiling relatives and his appellate attorney, Joseph DeFelice of Kew Gardens. "Nothing can bring back 10 years in prison but at least he's got a future now," DeFelice told Nassau Supervising Judge Teresa Corrigan shortly before she tossed Galloway's conviction. Corrigan did so after prosecutor Sheryl Anania made the request "in the interest of justice," explaining that a call to the Nassau district attorney's office in July kicked off a Conviction Integrity Unit review that showed someone else was the true perpetrator of the crime. The caller, Anania said, reported that "the wrong person was convicted of this crime" and the caller "could no longer remain silent." That person also provided the name of the real culprit and the circumstances surrounding the shooting, the prosecutor said. A taxi driver was permanently disfigured and needed a metal plate implanted in his head following the May 15, 2008, shooting by Hempstead's railroad station in which authorities said the culprit opened fire and shattered the man's jaw. Authorities had alleged at Galloway's attempted murder trial that he got angry at the cabdriver because the man was double-parked and blocking his way. They had alleged Galloway left the area, came back about 15 minutes later and shot the victim from about 10 feet away. "I sit in jail sometimes and I just ask myself, 'How could this be happening to me?' " Galloway said at his 2009 sentencing, insisting on his innocence as another judge sent him to prison for 25 years. In an interview Thursday, Galloway said he didn't know the identity of the person who recently called prosecutors about his case, but had believed all along the truth would come out. "Thank you for doing the right thing," he said, directing his message to the unidentified caller. The district attorney's office reinterviewed witnesses and reviewed trial evidence as part of a new investigation that led officials to conclude that a person who is already behind bars for a different conviction committed the shooting, authorities said. But because of the 5-year statute of limitations for attempted murder, prosecutors said they could not charge or publicly identify that person. Nassau District Attorney Madeline Singas said in a statement Thursday that with her office's motion to vacate Galloway's conviction, prosecutors sought "to right this injustice" against him. "I wish Mr. Galloway all the best as he moves forward as a free man," she added. Galloway's lawyer said the case "emphasizes how misidentification is one of the greatest problems with the criminal justice system." He added: "Here we had two people that identified him at the trial. The descriptions really didn't match and yet he was convicted." Galloway's mother, Cheryl Johnson, 57, cried as she stood with her son for the first time in years. "As a breast cancer survivor, you want to live to see this day come true," she said. "That's all I looked forward to, to see this day come true." Bridget Murphy is a Newsday criminal justice reporter.